The Busoga Tourism Initiative in an effort to promote tourism in Busoga has organised another Hill climbing challenging starting This Friday, 8 May 2014, and ending on Saturday 9 May 2014. The challenge attracts many tourist and avid climbers in and around Busoga and is an interesting way of marketing the region. 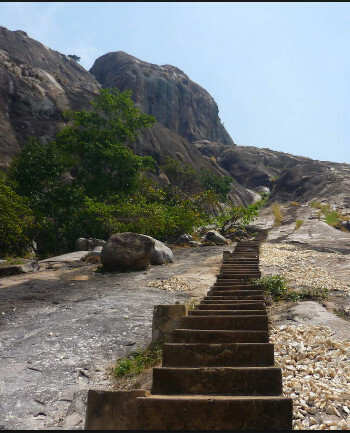 Kagulu hill found in Jinja is one of Busoga’s more popular tourist sites. It is about 3600meters high and has many caves which are rich with history and interesting to explore. Kagulu hill is one of the tourist sites that the Speaker of parliament Rebecca Kadaga, visited with some Turkish investors a few weeks ago in a bid to market the region’s tourist sites and to encourage the investors to invest in the region, especially in tourism. Mr. Edward Balidawa, the chairperson of the Busoga Tourism Initiative and also the organizer of the Kagulu hill climbing challenge said that the idea to market the regions tourist attraction was inspired by how the people living the mount Rwenzori region have benefitted from tourism, and how that region has grown economically with tourism as a major source of income. Unlike the people living near Rwenzori, Busoga had not taken time to market and the attraction that the region has been blessed with such as the Source of the Nile, the Bujagali falls, and Kagulu hill. However the region seems to have woken up and is now doing intensive marketing for its tourism sector. The Speaker’s visit and tour of various tourist sites with potential investors, the hill climbing challenge, all imply a decided effort in promoting Busoga tourism. The President of Uganda, H.E Yoweri Kaguta Museveni is expected to grace the event as the chief guest. The speaker of parliament who is also the Chairperson of the Busoga Parliament Group and Maria Mutagamba the Minister of Tourism are expected to take part in the walk up the hill. The event is set to be an entertaining one with Dr. Jose Chameleon entertaining the guests. Dr. Jose Chameleon is also the Busoga tourism goodwill ambassador. Busoga was once a major player in tourism in Uganda, before attention was redirected to Bwindi Impenetrable forest which offers gorilla trekking expedition for tourists. Hopefully the Kagulu hill climbing event and all the other efforts to market tourism in the region will be a successful, and will go a long way in promoting tourism in Busoga and establish it as a major tourist destination in Uganda once again.